The Stalker is an ominous, vengeful figure that infrequently appears during missions, encountered with a level that ranges anywhere between 30 to 70, that will target and attack a single player within the current cell. This enemy will taunt the player with messages in a similar fashion as bosses. For the duration of these messages, the targeted player's HUD will flicker, along with any surrounding lights. After a total of three taunts, the stalker will teleport into the session and proceed to attack the targeted player. 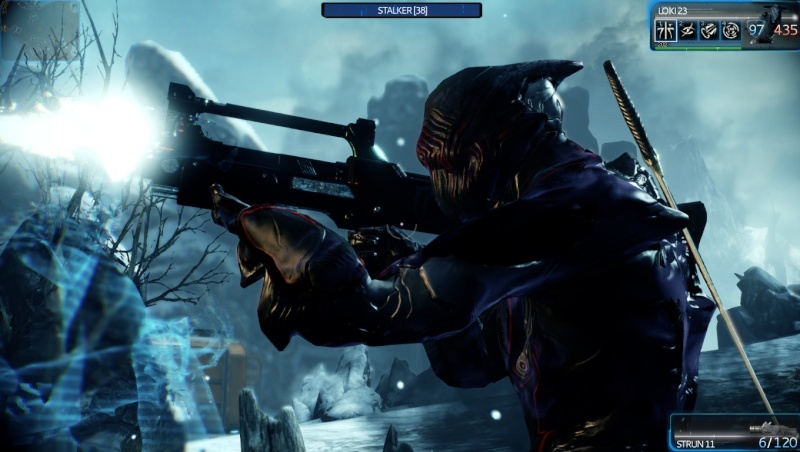 The Stalker's current arsenal is comprised of a bow known as the Dread, a scythe called Hate, throwing knives known as Despair, and an unknown exo-armor that is capable of using power modules from a variety of different Warframes. If the targeted player dies, the stalker will dissappear in a cloud of black smoke. If the Stalker is killed, a bounty of blueprints and more can be obtained. It seems the Stalker has a chance of spawning anywhere where the player is. At least one boss must be slain before he can target a player. In a team, he will contact only one player, but all players will see the lights flickering before his appearance. 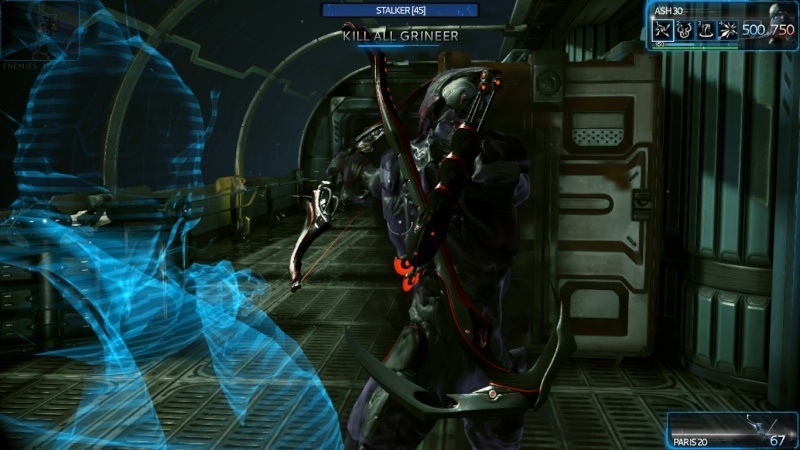 The Stalker can also appear in an endless defense mission. 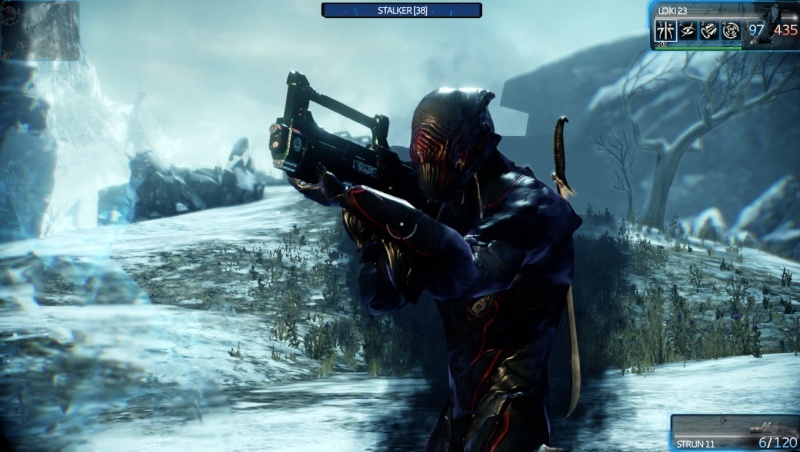 The Stalker is factionless and can be attacked and killed by any other faction such as the Grineer, Corpus and Infested. 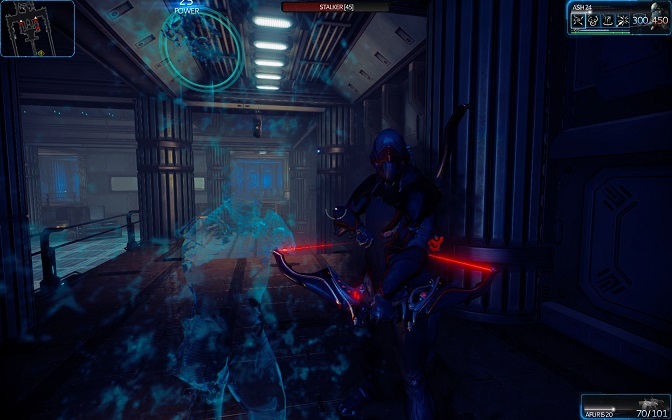 However, if the Player escapes his grasp, the chance that the other enemies will triumph is very low, as his combat ability is similar to a Tenno's. He can also glitch and will not be attacked at all, allowing both the enemies and the stalker to kill you. 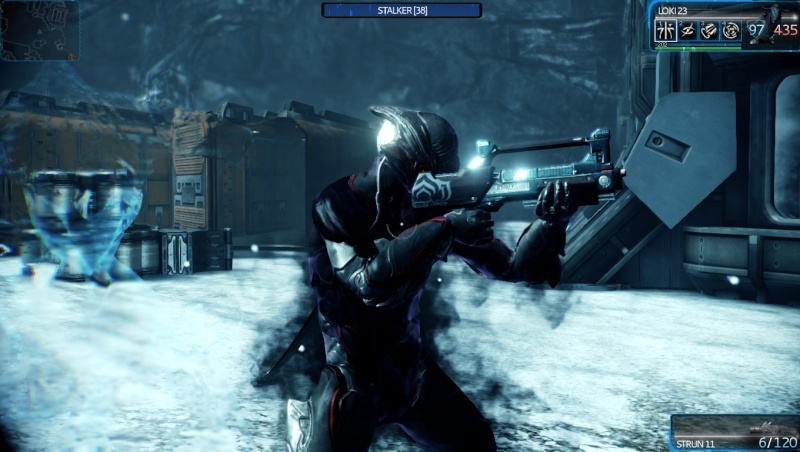 The Stalker can be harmed by Tenno Abilities, such as Frost's Freeze or Rhino's Stomp. If the Stalker has killed you, he won't reappear in the same mission to kill you again, or any other player. 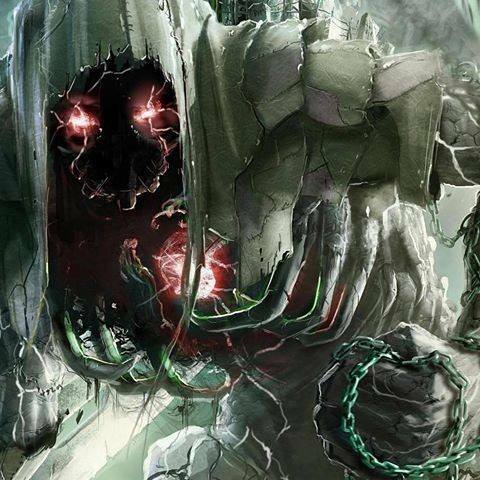 It is speculated that the Stalker is of Orokin origin. Lights will always flicker before the Stalker appears, and right after he leaves/is defeated. 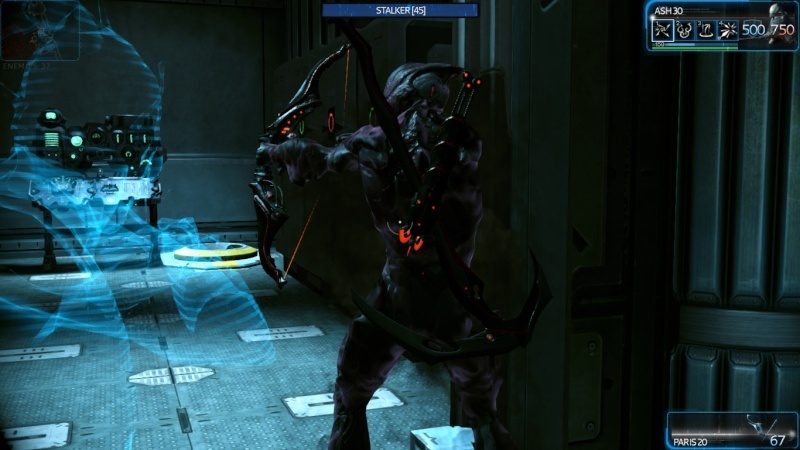 The Stalker appears to be wearing a dark-colored Excalibur suit with a unique helmet. 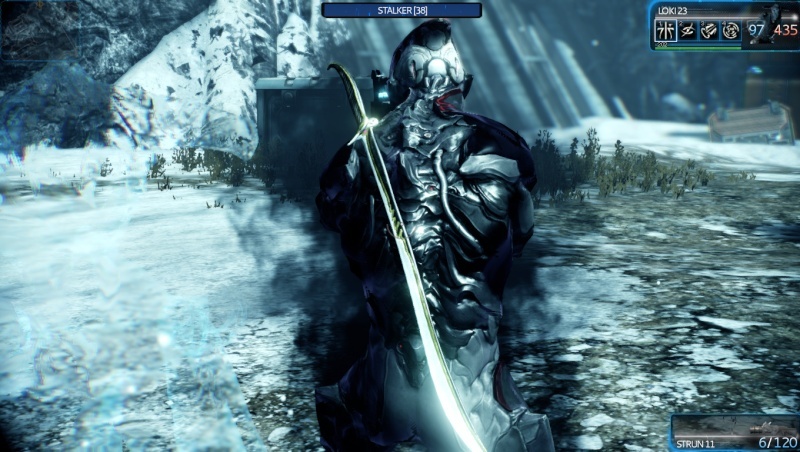 Players should be very mindful of his Slash Dash, as with his new melee scythe, he can cripple, and possibly even outright kill an experienced Tenno. 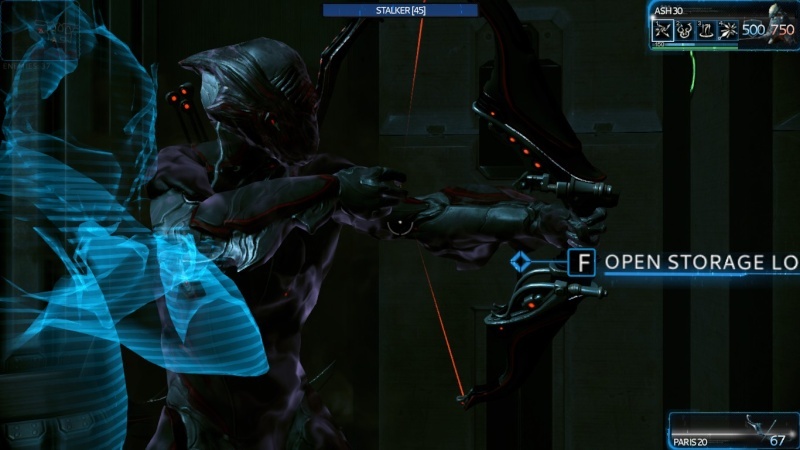 He can also appear in the Orokin Void. DREAD is the calling card of the Stalker. It fires arrows that can decapitate. Draws from the Sniper Ammo pickup pool, which is among the rarest of the ammunition pickups. Dead enemies will stop arrows from hitting the target behind. When charging arrows between each shot, enemy shields will often start to regenerate inbetween each shot. HATE is a scythe with a cruel blade, wielded by the Stalker. Used by the Stalker, DESPAIR throwing blades have a mono-filament edge, sharp enough to penetrate a warframe. Higher Base damage than the Kunai. Trajectory can be inconsistant, making longer ranged throws more difficult. Cannot score a critical hit. Currently has a glitch where if you click multiple times while firing, the reload animation will glitch and will continue to reload depending on how many times you clicked. You need to kill a boss, not your sentinel or another player. He most likely comes after you if you are separated from a group if you play with others in a squad. He wont come in a boss mission, but can come in the void or defense mission. He also will show up at m-prime in mercury. He wont show twice in the same mission. Just one little correction. The Stalker CAN appear in a boss mission, I got him once on Titania after about a minute into the mission. I somehow don't get the point of this thread... It's all already on the wiki and a wiki link on the Stalker page leads to a lore thread on the forums. I can confirm him appearing in M prime. EagleRise a écrit: I can confirm him appearing in M prime.